If you’re BFFs with your Crock Pot and you can’t get enough slow cooker recipes, we get it. There’s nothing better than an easy dinner that’s big on deliciousness and low on prep. Scroll on for slow cooker chicken recipes, scrumptious soups, and other meals you’ll have no trouble mastering. 'Tis the season for butternut squash! This soup from One Lovely Life has butternut flavor and is creamy and rich without a drop of cream! Plus, it's a great go-to when you want to feel cozy and warm on a chilly day. Have your ham, even when the holidays have passed! This slow cooker version from Dinner at the Zoo has a delish three-ingredient glaze that packs a punch of flavor. With just five minutes of prep, it doesn't get easier than this! Chicken soup is a winter weather staple, but this creamy version from Scrummy Lane really takes things up a notch. It has plenty of veggies, delish gnocchi, and kid-friendly flavors. Trust us, you'll ladle it up. Ready for the best ramen news ever? You can make your fave noodle soup right in the own slow cooker! All you need for a broth that's drink-from-the-bowl good is this recipe from A Spicy Perspective. Then just add noodles, chicken, and soft-boiled eggs! What's sweet, sour, and so tasty? These meatballs from Salt & Lavender. They have festive cranberry flavor and are great served with jasmine rice. Even better, this recipe will leave you with lots of leftovers! There's nothing like some comforting potato soup on a winter day—and there's nothing like this slow cooker version from Kristine's Kitchen Blog. It's creamy (though there's no cream), you can opt for extra cheese, and it sneaks leeks into your kiddo's dinner. Holy moley—did you know that you can cook a whole chicken in the Crock Pot? Dinner at the Zoo has the rotisserie-style scoop: a simple spice blend, a few minutes of prep, and presto! When your day is chilly, busy and full of hungry kids, have no fear. Just whip up this delish dish, courtesy of Kari from GI 365. It only takes a few simple ingredients (including butternut squash!) and you'll love the leftovers. Psst! This recipe from Kristine's Kitchen Blog is a little bit chili, a little bit mac and cheese, and a whole lot of kid-pleasing deliciousness. Kristine even includes a make-ahead freezer option of this meat-free meal. Score! What's high-fiber, low-fat, dairy- and gluten-free ... and delicious? This recipe from Homemade Food Junkie! It's so easy to throw together and hearty enough to fuel the whole fam for any adventure ahead. Pro tip: Customize with additional veggies for an extra healthy kick! For the ultimate comfort food, try this egg and meatball dish from Plated Cravings. The meal comes together easily in a slow cooker. Simmered in a smooth marinara sauce, this high protein meal works for hungry hoards any time of day. 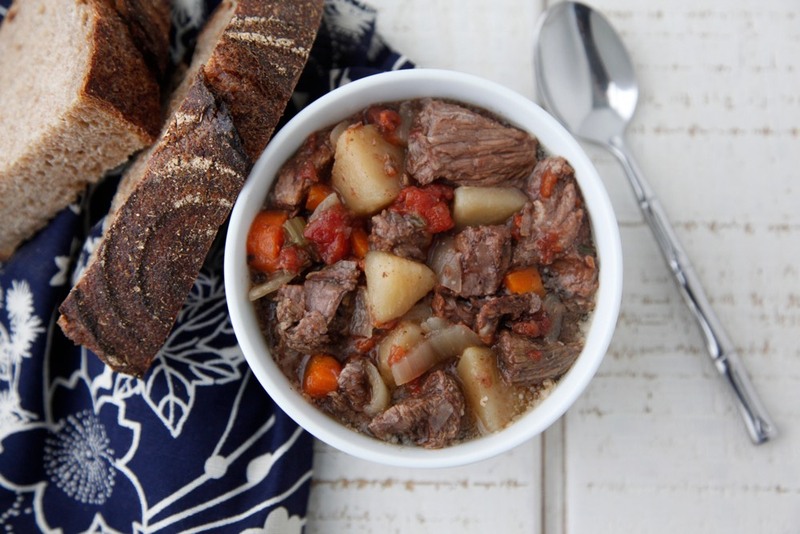 A good beef stew is hard to beat, and this crock pot version provides the best of both worlds—it can be thrown together in the morning and will be a tasty feast by the evening. Double the recipe, and you can even create leftovers to freeze for later. The list of ingredients in a Minestrone can be off-putting, but you won't regret making this Crock Pot version. The kids will get a healthy dose of veggies while the cook will get a break from the kitchen—win, win! Serve it with grated cheese and a slice of bread. Need a reminder that summer's on its way? This Hawaiian chicken recipe should do the trick. Kids will love the blend of sweet, tangy and savory flavors and parents will love that it's an easy Crock Pot cook up! Head over to Averie Cooks for the recipe. Lasagna gets a slow cooker makeover with this recipe from Phyllis Good's cookbook, Stock the Crock. This version can be adapted by substituting hot Italian sausage meat for plain turkey or ground beef. Then you add the more delicate items like spinach and noodles towards the end of the cook time. Want a veggie version? We have you covered, just click here. Ricotta cheese gives this kid-approved Crock Pot chicken recipe its extra creaminess. The chicken cooks up in your favorite spaghetti sauce with the pasta and broccoli added to the pot at the end of the cook time. Head to Aggie's Kitchen for the recipe. This is seasonal comfort food you'll return to again and again. The recipe from Pinch of Yum will feed an army so you'll have plenty of leftovers to keep the family well-fed for the week. This tagine is a great dish to make ahead for the weekend. There's protein and veggie goodness in every bite, and you can adjust the seasoning to accommodate tiny taste buds. Head to Feed Me Phoebe for the how-to. This vegetarian chili is healthy comfort food, and it is so simple to make in a Crock Pot. Including three kinds of beans, this recipe from Show Me The Yummy is gluten and dairy-free. Carrot cake for breakfast? Yes, please! This recipe from Foxes Love Lemons will revolutionize your morning routine—just prep before bedtime and by dawn you'll have a bowl of sweet creamy, carrot and coconut flavored oatmeal to set the kids up for the day. A slow cooker pulled pork recipe can keep the family well fed for a week. This recipe from Plated Pixels is super simple and is sure to be a favorite with the kids. Put the shredded meat into a bun, tortilla or serve with rice or pasta. Five-minutes of prep is all that this recipe demands. Add the cornstarch, and steam the broccoli towards the end of the cook time and you've got a no fuss, nutritious meal for the family. Check out the how-to and video at My Fussy Eater. This pumpkin and lentil soup from Scrummy Lane is thick and creamy and packed with nutrition. Prep in the morning and you'll have a healthy dinner ready for the evening. Bonus: this is a soup that tastes just as good reheated the next day. Tomatoes really benefit from slow cooking, and this rich, low-calorie tomato soup does double duty as a pasta sauce if you need one during the week. Get the fool-proof recipe from Erin Clarke at Well Plated.